If you are a bird, your feathers are only alive and supplied by blood when they are growing. 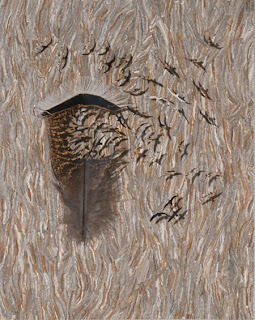 Once fully formed, the feathers are clinically dead and the process of decay begins. Fortunately feathers are mostly pretty tough. One type of feather function is meant for decay: powder-down. This tiny type of down feather is always converting the tips into fine powder. The purpose of these feathers are to be spread when a bird preens where the powder soaks up grime and waterproofs. Kind of like what some of the conditioning products do that we put in our hair. Otherwise, only when the feather cells die are they ready to perform the function of flight, warmth, protection,, waterproofing, and display. Feathers begin wearing down immediately after they are grown. As this process goes on, it can change the bird’s appearance. Male goldfinches for instance, look quite different at the beginning of the breeding season and the end simply because the colorful tips of the feathers have worn down. Birds try to slow down the process of decay so they can look good and function well. They preen to arrange their feathers to keep warm and fly well. They take dust baths to slow down feather-eating mites. When feathers are shed, they keep their structure for a little while at least, until they decompose, are eaten by bugs, and become dirt. How do birds throw out their old feathers? On schedule. Except for a few birds, they don’t shed all at once or they couldn’t fly or keep warm. They shed once or twice a year in a pattern to let new feathers grow in. More about this later in another post.